Kevin de Bruyne was the hero as Manchester City finally settled the quarterfinal tie against Paris Saint-Germain at Etihad Stadium. After a 0-0 first half, City finally broke deadlock when Kevin De Bruyne scored in 76th minute to put City in their first ever semifinal. Manchester City hosted Paris Saint-Germain in the second leg of their quarterfinal champions league tie on Tuesday night, 12 April 2016. Having already drew 2-2 in Parc de Princes last week, City just needed a draw to make it through to their first ever Semifinal in European competition. They had a superb chance when a penalty was awarded but Aguero missed that golden opportunity to go 1-0 up and wrap up the result. Kevin de Bruyne’s second half goal put City in the semifinals of 2016 champions league. Manchester City were hoping to make it to their first ever Champions League semifinal as they took on PSG in the second leg at Etihad Stadium. Sergio Aguero was the guilty party after missing the penalty at half hour mark as City failed to take several opportunities to take the lead. Both teams went into the break with 0-0 and although this result will be enough for City to progress, PSG just needed to win the game and qualify for semifinals. Manchester City warmed up perfectly for their 2016 champions league quarterfinal first leg visit to Paris where they are set to take on French Liga 1 champions Paris Saint Germain this Wednesday night, 06 April 2016 in what should be the highlight of midweek european games. BT Sports will have the live coverage in the UK while Fox2 will broadcast in US. We will have more details about the TV coverage around the world on the day of the match. City vs PSG Preview: City defeated AFC Bournemouth 4-0 away from home with Kevin de Bruyne making his return from injury while Fernando, Aguero and Kolarov were on target in easy win keeping their top four finish well and truly in their own hands. 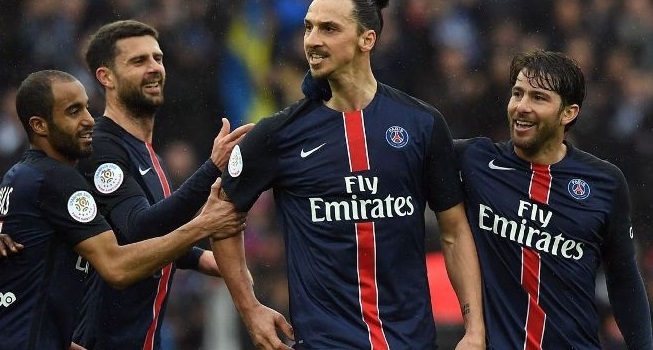 PSG on the other hand continued their stunning form with another 4-1 win with Zlatain Ibrahimovic scoring a superb hattrick as they step closer to winning 2015-16 french liga title. Paris Saint Germain has already disposed of English champions Chelsea in the round of 16 and they will be favourite against City as well although playing second leg away is never easy. Manuel Pellegrini side need to get a good result in Parc de Princes in order to stand a good chance in return leg at Etihad Stadium. City have been pretty solid in champions league this season having topped what was a difficult group with Juventus, Sevilla and Borussia Moenchengladbach. In the round of 16 they had relatively easy tie compared to other big guns when they disposed off Dynamo Kiev. But their real test begin now and alot depend on their performance as far as English football is concerned. City will definitely be underdogs in this game and that might help them take the pressure away while PSG who has reached quarterfinal stage 4th time in a row will be looking to reach Semifinals for the first time. Manuel Pellegrini has massive injury worries as Manchester City will be without captain Vincent Kompany for both legs while Joe Hart and Yaya Toure are both ruled out for the first leg with Sterling and Fabien Delph also doubtful for the PSG trip. Laurent Blanc on the other hand pretty has the full squad to choose from and he will be looking to use the pace of Lucas Moura and Ongenda behing Ibrahimovic. Di Maria, Matuidi and Rabiot to start in midfield. This is how I expect both teams to lineup on Wednesday. 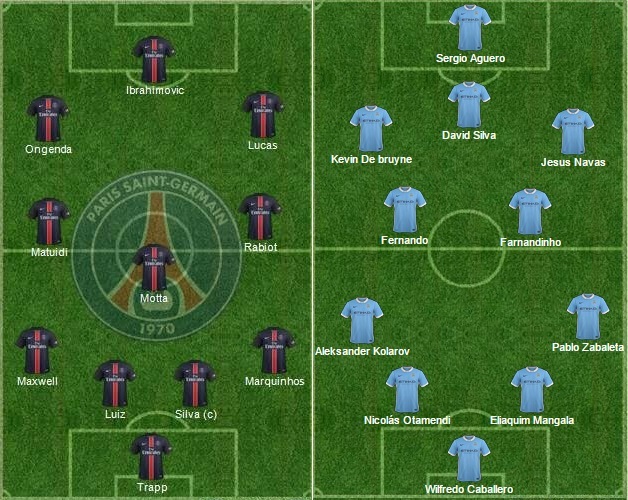 Match Predictions: PSG has been one of the most inform team in Europe alongside Barcelona and Bayern Munich. When the draw was made PSG were straight away made favourites for this tie but City are no pushovers. Out of the title race in Premier League, City has a point to prove and players will be looking to provide a perfect sending off to Manuel Pelligrini and I expect a tight game in france and event fancy a 0-0 draw which will suite City. Absolute cracking game at Parc De Princes saw two oil rich sides taking on each other in quarterfinal of 2016 champions league. Manchester City took the lead through Kevin De Bruyne who finished off a superb move with a wintage finish inside the box. PSG were gifted their way back into the game when Fernandinho under pressure from Ibrahimovic tried to pass back the keeper but ball deflected off Ibrahimovic into the goal. PSG started scrappy but won the penalty in 14th minute which was missed by Ibrahimovic as Joe Hart denies him with a good save in 15th minute. City pegged back with a goal of their own through summer signing De Bruyne in 38th minute with a superb worked goal.